The MFRSR (Multi-Filter Rotating Shadowband Radiometer) simultaneously measures the total sky, diffuse sky, and direct solar beam intensities at seven wavelengths between 400 and 1050 nanometers. Intensities are converted into irradiances in units of Watts per square meter per nanometer. The rotating band is controlled by a dual purpose computer and data logger. Intensities are measured with the band in four different positions: when the band is down the total intensity of the sky is measured; when the band blocks the Sun only the diffuse sky radiation is measured; supplementary measurements are taken with the band adjacent to the Sun to correct for the portion of the diffuse radiation hidden by the band when blocking the Sun. The computer then subtracts the diffuse intensity from the total to obtain the intensity of direct radiation from the Sun. From the irradiance data we extract the optical depths (amounts) of atmospheric aerosols, ozone, and water vapor. 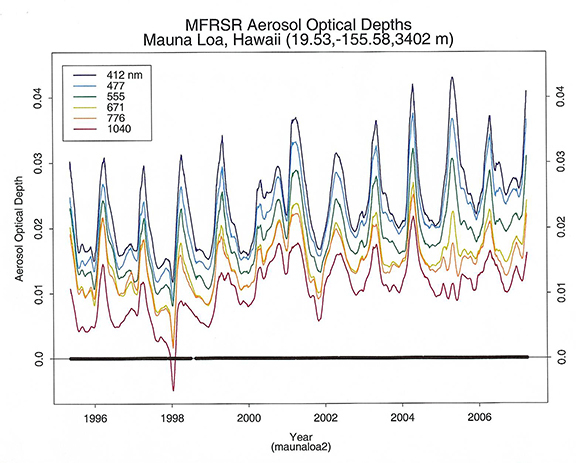 Seasonal trends in aerosol amounts from localized sources are superimposed on longer term trends caused by both naturally occurring aerosol events (dust and smoke plumes, volcanic eruptions) and human-generated aerosols (pollution in general). The case is much the same for ozone. By monitoring aerosol amounts over time scales of at least a decade the relative influences of naturally occurring and human-generated aerosols on climate can be separated. This will help to answer the question of how people are affecting climate change. The MFRSR Aerosol Monitoring Network has instruments in Arizona, California, Hawaii, Washington, and Australia.